Jesus man. Just go for the easy pass. Scotland again making the wrong decisions. All the attacking play minded but simple bad decisions and handling skills letting them down. Updated prediction. 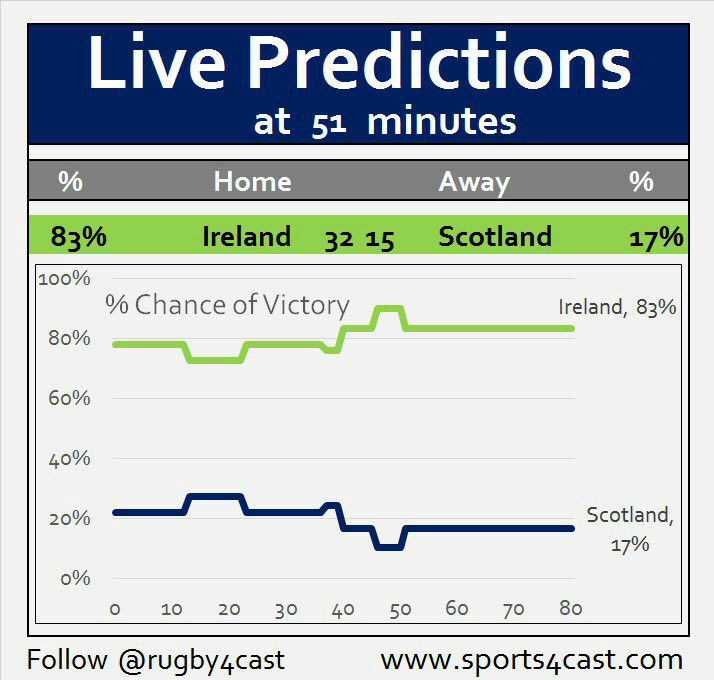 Pre match the predicted score was 31-18, Ireland with 78% chance. Yep Scotland doing the most difficult part but messing up the easier stuff somehow. Still as soon as they go through phases at speed they seem to find room in the Irish defense. Feel for Scotland today though. Three good opportunities not taken. Lovely try though. Scotland mashed Ireland in the scrum there, to me that should have been a Scotland penalty. They have one now though. Tighten up Nathan, ye know that Barnes is clearly biased against Ireland and will ensure that Scotland win in the end. The worst referee in the world. Nonsense from Barnes. Denton rolling away and Irish players come in from the side and push him back and he's penalised. It was not good against Wales either. He needs to have a word with himself if he wants to get in my fantasy league team again! Is that the championship right there? Guess England will really have to chase the BP in Paris? eirebilly wrote: Is that the championship right there? I think it is. Can't see England winning let alone with a BP. We'll get mullered at the breakdown again. Ireland's worries about Barnes were certainly unfounded - huge penalty count against Scotland. I'm not claiming he's biased against us by the way. Absolutely. No way are England going to score 4 tries against France AND Ireland. Championship was over last week. England just need to take 2 wins in the next 2 games and forget chasing tries. If it comes it comes. I doubt it will. RDW_Scotland wrote: Ireland's gunsvgerms, collapse2005 and rodders worries about Barnes were certainly unfounded - huge penalty count against Scotland. RDW_Scotland wrote: Ireland's worries about Barnes were certainly unfounded - huge penalty count against Scotland. I was going to ask if he's been forgiven over in Ireland now, but didn't want to sound like I was moaning about the calls. In the list of things that have lost us this game any refereeing decisions would be a long way down, if it was even on there at all! It has to be a mental thing with Scotland to win away from home. They have played some excellent rugby, certainly enough to beat Ireland but their lack of composure, handling and clinical finishing has seriously let them down. They way they played here against Ireland would have to have led to a victory if at home. eirebilly wrote: It has to be a mental thing with Scotland to win away from home. They have played some excellent rugby, certainly enough to beat Ireland but their lack of composure, handling and clinical finishing has seriously let them down. The sweaty socks couldn't get up for this game then! Ah come on Barnes you've got to be consistent - Ireland player completely disrupting the ruck and not getting out the way! RDW_Scotland wrote: Ah come on Barnes you've got to be consistent - Ireland player completely disrupting the ruck and not getting out the way! It must be incredibly frustrating for you Scottish fans. Scotland have actually played very well today. Ireland simply more clinical and more composed. It's not a mental thing with scotland it's the fact they are playing attacking rugby which is riskier. When 9u take those risks and how comes with paling together for a good length of time. While it develops you will win games like 2 weeks ago or not today. Either game could have gone either way. The thing which is impressive is how townsend is developing your pack. Scrum is looking v good. Balance good. Lineout needs work. Get that sorted is he next step. Consistency will come. Wee bit gutted at the score but we never expected a win really. It's at least a case of us being outplayed and not playing awfully for a change. No shame in that, Ireland deserve kudos for taking the game to us. No 7&1/2 wrote: It's not a mental thing with scotland it's the fact they are playing attacking rugby which is riskier. When 9u take those risks and how comes with paling together for a good length of time. While it develops you will win games like 2 weeks ago or not today. Either game could have gone either way. The thing which is impressive is how townsend is developing your pack. Scrum is looking v good. Balance good. Lineout needs work. Get that sorted is he next step. Consistency will come.